You might remember that last year's Christmas knitting had an last-minute addition when baby Sydney arrived a little bit early and a lot bit tiny. 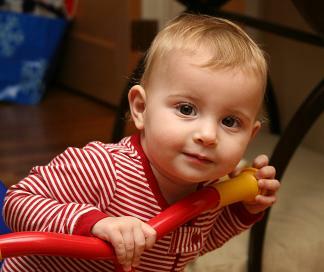 This Christmas she's a rambunctious chunk of a girl who is in the 95th percentile for height. Oh, and she started walking at 11 months. 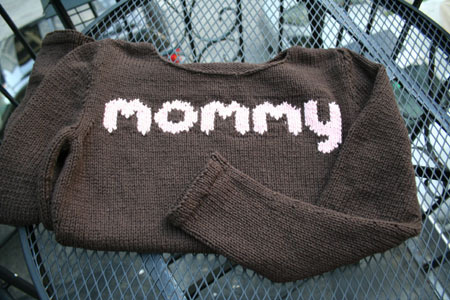 But that doesn't mean she's too big to get a hand-knit sweater from Auntie Gringa! 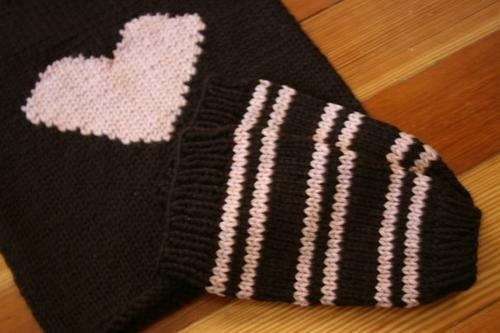 The leg warmers were easy-cheesy, I basically used a sleeve pattern and added some ribbing at the top and bottom. And they came out so dang cute that I had to make sure that she had the full outfit. It just so happened the BabyGap had a denim skirt on sale in her size. I can't wait to see pictures of her in this! 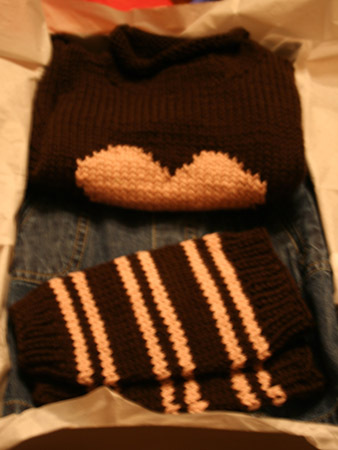 So is it any surprise that when Rachel decided that Syd needed a handknit sweater for Christmas, it would (1) involve a pink heart, and (2) incorporate Rachel's favorite color combo of pink and brown? 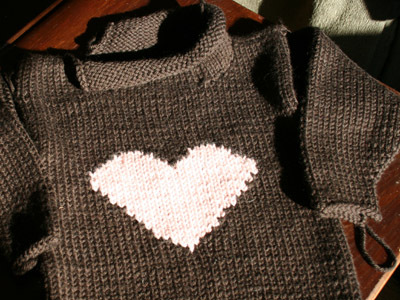 The pattern is from Knitting for Baby and the yarn is the super-soft Cashmerino Aran. I had to make some adjustments for gauge difference, but the sweater went very fast (cast on in Granada, finished before we got to Seville!). The only thing keeping me from the seaming -- besides laziness, of course -- is trying to decide if the roll-neck is too long. I knit it exactly as long as the pattern calls for but it seems awfully bulky, especially for Syd, whose sensitivity to animal fibers is still an open question. There's enough yarn left for an accessory, and I have just the thing in mind. I'll post it once I'm sure it's going to work -- but if it does, it's going to be so fabulous.